Almost every school focus too much on theoretical knowledge. Each type of knowledge holds an equal value. The understanding of something either comes from books or by practically doing it. One can gather all the information from the popular books that teaches us almost everything but by applying all the theory through practical work is what gives us mastery. 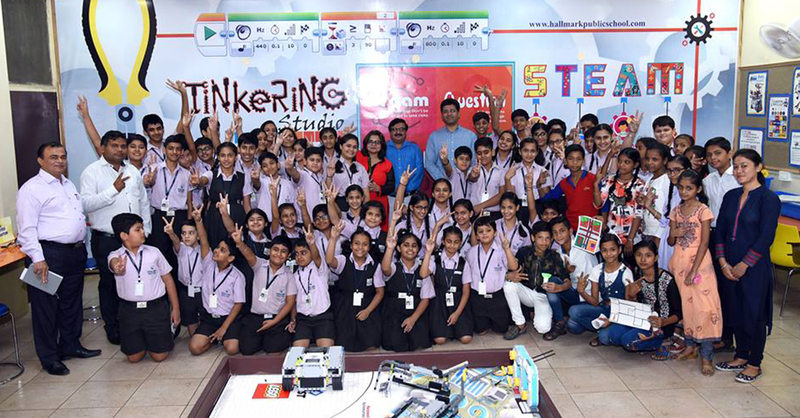 Atal tinkering lab Has been launched at Hallmark Public School, one of the best school in Panchkula. It is solely dedicated to shape the young minds and their ideas while understanding the concepts of STEM (Science, Technology, Engineering and Math) through do-it- yourself (DIY) kits. The idea is to provide them the (DIY) kits on latest technologies like 3D Printers, Robotics, Internet of things (IOT), Miniaturized electronics, open source microcontroller boards, sensors etc. Moreover, having the ATL in the school premises will definitely boost confidence and motivate young minds to learn and explore being a scientist and technical experts. The activities at the lab are designed to invoke or increase the levels of creativity amongst the students, and go ove and above the academic curriculum and text book learning. ATL encourages creative mind and understand how a mind is capable of being resourceful. They boost their curiosity and imaginative skills. They build the young mind by inculcating skills such as computational ability, modified learning, computing, problem solving, etc. Hallmark has proven to be the most innovative school amongst all the Panchkula CBSE schools. Their vision is to ‘Cultivate Neoteric Innovators’, and foster inventiveness and entrepreneurship skills among students. “How deluded we sometimes are by the clear notions we get out of books. They make us think that we really understand things of which we have no practical knowledge at all.” Therefore, the practical application would help the students learn with a lot more clarity and gain experience for the future.